The topsy-turvy nature of 2012 GOP primary polling looks to be repeating itself in the 2016 cycle. Seemingly out of nowhere, former Governor Mike Huckabee has deposed Chris Christie as the Republican leader to take on Hillary Clinton. There's good and bad news for both Democrats and Republicans in the new 2016 national survey from the pollster liberals love and conservatives love to hate, the occasionally accurate and always trolling Public Policy Polling. The bad news for Republicans is their previous standard-bearer, Chris Christie, continues to take a beating in the polls for the "bridgegate" scandal. The New Jersey Governor was a fairly rare political figure for this day and age where everyone seems to hate anyone and anything associated with politics and Washington D.C. He had a double-digit positive favorability rating that stretched across party lines. But over the course of just one month, Christie's favorability rating dropped from the best of the field (43/31%) to THE worst (31/46%; even lightning rod Tea Partier Ted Cruz manages a -10% net rating). Having previously led Hillary Clinton by 3-pts (45-42%), Christie now trails by 2-pts (45-43%). What's more, the entire Republican field looks pretty unpopular nationally. The most popular potential GOP candidate, Mike Huckabee, could only manage a 37% favorability rating. And even then, his unfavorable rating was slightly higher at 38%. The rest of the field ranges from a net favorability rating of -6% (Paul Ryan) to -15% (Chris Christie). The good news, however, is that despite all of this, every Republican tested looks like they could be competitive in a national race against Hillary Clinton in 2016. All of them except Ted Cruz poll within the margin of error of Hillary (3.4%). And Christie, the GOP's most unpopular candidate at the moment, leads Joe Biden and Elizabeth Warren by significant margins. The bad news for Democrats is that like the Republicans, their standard bearer has also fallen in the court of public opinion. Hillary Clinton's favorability entered negative territory for the first time in a PPP survey in years. And potential primary competitors Sen. Elizabeth Warren and Vice President Joe Biden look particularly weak. The good news for Democrats isn't readily obvious on the face of the poll. But they can find a little relief by pulling back the curtains and examining the crosstabs, for PPP is finding a much more friendly GOP climate than existed in either the 2012 or 2008 presidential elections. In fact, at least two of their more significant demographic findings (race and age) much more closely resemble the 2010 midterm electorate, when Republicans picked up a nearly unprecedented number of House seats and carried the popular vote handily. Consider PPP's race findings, in which 3/4 of poll respondents identify as white, the highest amount since the 2004 presidential election. We know from examining every presidential election since 1992 that the white share of the vote has dropped from 4% to 2% per cycle. If that tradition holds in 2016, we could expect the white share of the total electorate to be between 68-70% (it was 72% in 2012). For comparison, CNN exit polls showed that white voters made up 77% of the vote in the 2010 midterm election. Likewise, Hispanic voters have seen their share of the electorate increase in every presidential election since 1992 (between 3% and 1% per cycle). In 2012, they made up 10% of voters. By that standard, you'd expect Hispanics to make up between 11-13% of a 2016 presidential electorate, and not the 9% found by PPP (which is much more similar to the 8% found by exit polls in 2010). The African American and Asian share of the vote hasn't increased in ALL of the presidential cycles, but has been on a general upward trend of late. Photo courtesy of the AP/Steve Cannon. It's amazing what a year can do in politics. Last year about this time, still reeling from the aftermath of a devastating presidential election loss, Republicans looked awful on the generic congressional ballot. President Obama was still in the midst of his post-victory honeymoon with voters, at least as far as his job approval ratings were concerned. And up and down the 2014 Governor/Senate race roster, things just weren't looking as bleak for Democrats as they could. Flash forward and Democrats and Republicans are virtually tied on the generic ballot (while Democrats haven't led in a single poll besides Rasmussen or YouGov for nearly two months). The President has recently gone through a spate of the worst job approval ratings of his presidency, and is still suffering on that front. And most importantly, more than a few 2014 races are looking better for Republicans than they did one year ago - namely, the Florida Governor's race. Per Democratic pollster, Public Policy Polling, over the course of the last year, former Republican Governor and current Democratic gubernatorial nominee Charlie Crist has gone from an impressive 53% of the vote in a match-up with Republican incumbent Rick Scott (against his 39%), to 43% of the vote (with Scott up to 41%). In other words, Crist's lead has dropped from a substantial 14 points, to a statistically insignificant 2 points - a net drop of 12 points. One year ago, half of Florida voters had a favorable view of Charlie Crist. Today, that number has dropped to barely over one-third (36%). Meanwhile, unfavorable views of the former of Governor have risen from 38% to 46%. 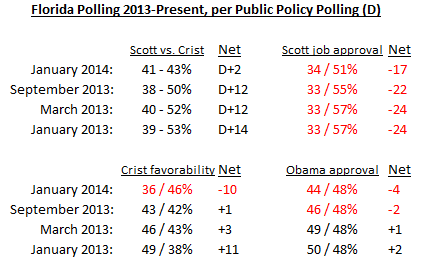 Overall, Crist's net favorability score has dropped 21 points since last January. Governor Rick Scott's suddenly competitive reelection bid is less due to any improvement among voters on his end, and more thanks to Charlie Crist's precipitous drop. While the governor's job approval rating has improved from -24 to -17 points, he's still at a measly 34% approval, with 51% disapproving. President Obama's approval rating is down, but only slightly from just after the 2012 election (a notable difference from most recent state findings by other pollsters).